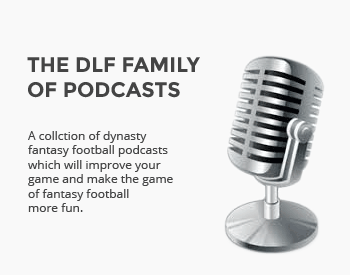 We continue the series with our choices for the candidates for best dynasty sell. Wow Ken reading this suggest that I should trade(sell) a bunch core of my core players. I own Robinson, Johnson, Evans and Golladay. I understand its situational due to rosters, rules etc. I took over a team in 2015. I stayed active to construct the roster that is a serious contender this year. I looked back and I have averaged 14 trades in the three years heading into week one of this year. Won some…and lost some. Also scored big time on some waiver wire pick ups along the way. Needless to say I am an active owner. Selling high and buying low is something I absolutely love to do. Robinson, Evans, and Johnson are a perfect example of it. Same with Golladay. Johnson I got rookie year preseason for cheap and Golladay off of waivers this offseason. Robinson and Evans were a complete buy low situation. My question or even a statment would be. Coming from a impatient owner. Isn’t it worth it to sometimes enjoy the benefits of these type of acquisitions. As much as I want to trade and try to improve my team. Because trust me I look to do it every day. Thinking of trades like Johnson for Melvin Gordon and Watkins. Wondering if it’s the right thing to do. Being in a win now mode. I am hesitant to move some of these type of names. But at the same time knowing when to trade a Matt Jones or a Justin Forsett can really boost your roster if you do it right. I really enjoyed this article as it got me thinking about when to buy low and sell high. But it also gave me perspective on a roster construction and how that players a part in your decision making to some degree. Thanks again Ken.